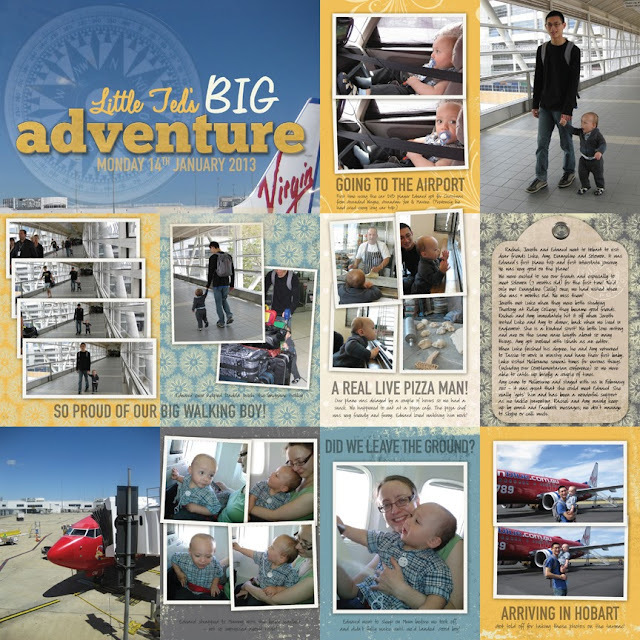 This is a page I created to document Edward's first plane trip, for my Project Life album. I took a lot of photos that day, so I decided to tackle it digitally. I originally made this for a Design House Digital 4-Play challenge, so it used just the four specific kits from the challenge, and then I later added the compass under the title. ...the Life Paper Scrapbook Project Life Challenge #1: Layering in Project Life! How exciting! I've used lots of layers on this page: the patterned papers as a base layer, transparency and text over a photo for the title, and then many clustered and overlapped photos to fit as many in as possible. The pictures are jostled a bit to get a sense of movement, and the order they're in shows the progression of our journey. On the TV channel ABC4Kids, there's a cute little show called "Little Ted's Big Adventure". Yep, it's Little Ted from Play School, he has his own show! Actually I just saw today that Jemima now has her own show too: Jemima's Big Adventure :) Anyway, because our son Edward's nickname is Ted, that's what we called this holiday from the start! This was the first time we used the car DVD player, so I have pics of that (VERY thankful that it kept him calm, as we'd hoped). Although Edward was able to walk from 15 months, he rarely did until Christmas, so going for a long walk was still a big deal, and I took a bunch of pics of him walking along. He has a little toy that we call "Pizza Man" as he looked to me like a little pizza chef (but someone pointed out he is probably a traffic controller - oh well, the name has stuck!) So it was pretty cool to see a real live Pizza Man - he was such a nice guy too. Edward fell asleep before we took off, so he probably didn't realise we went up in the air at all! I followed the configuration of Becky Higgins' Design F page protectors, which I love, and used InDesign to create the entire layout, as it's much easier work in a grid and to crop images to frames than in Photoshop. I'm trying to avoid Photoshop for my Project Life, as it's a major time sucker for me! I only edit photos if they really need it, and I'm a lot less tempted to edit when designing with InDesign. There were four DHD kits used originally, but I later removed a stylised flower (from Mary Moseley's Reminisce-Flowers, Frames & Borders kit), and replaced it with the compass, so there's nothing from that kit on the final layout. The flower was quite geometric and resembled a compass, so that's where I got the idea, but I wanted a proper compass to complete the look. I'm an artist and graphic designer. I love things that are pretty, feminine, flowery and pink!